The Mahindra & Mahindra have been in a huge arbitration case with its Georgia-based autarchic automobile dealer, Global Vehicle. This happened because they got into a deal with Global Vehicle in 2010, but for reasons unknown they backed out later. They did win the arbitration case, but it left a massive dent on its brand in the American automobile market. For now, nothing seems to be in good taste for Mahindra & Mahindra in the American SUV and light pick-up truck market. But the firm is still taking the risk to re-enter America. Mahindra & Mahindra is secretive about its future plans in this foreign country, but a new rumor is doing the rounds, according to which, Mahindra may use a vehicle from its South Korean acquisition, Ssangyong to launch the Korando Sports Pick-Up truck in the US, which was showcased in the 2011 Geneva Motor Show as a concept SUT. This particular truck would immediately settle itself into the compact pick-up truck of the diesel segment in the American automobile market. This particular segment has no international auto manufacturing firms present to offer anything or to pose a competition to new entrants currently. Although, faith in the Mahindra & Mahindra brand is at an all time low in the American market right now because of the arbitration hustle with the Global Vehicles, but the firm is working towards re-building a dealership network across the nation. The re-launch is rumored to be in the year 2016, which is not very far. For now, Mahindra is selling its tractors all over the American continent successfully since sometime, and this has made the company hopeful to capitalize on. The Korando Sports Pick-Up Truck is boosted by a common rail 2.0 liter turbo-diesel engine which enables it to gather a massive power of 155 Bhp in its belly with a peak torque of 360 Nm. Both of these figures are pretty higher than what the previous 2.2 liter turbo-diesel engine produced in TR40 Pick-Up truck which was to be offered to the American automobile market. There will be a choice of automatic or manual 6-speed transmission along with both the two and four wheel-drive variants being attainable. 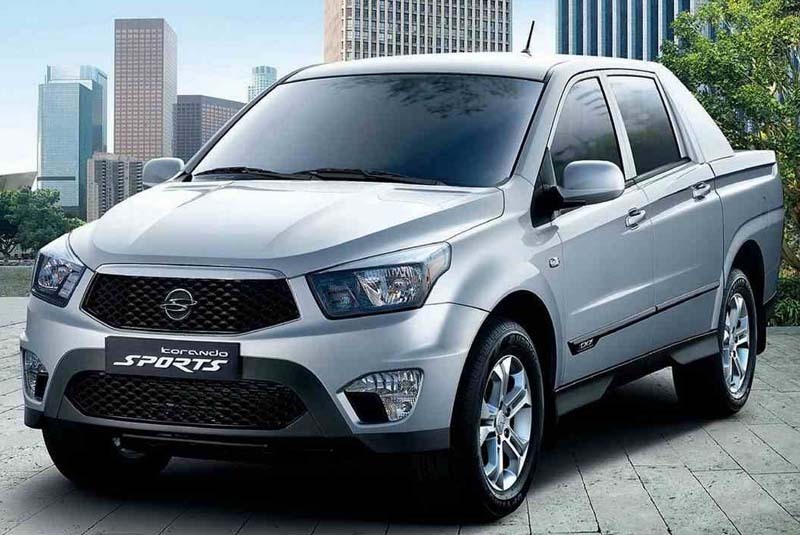 Other than this, the Korando Sports Pick-Up truck by Ssangyong brings with it a good fuel efficiency of 36 MPG in South Korea which is a huge addition to the mileage from the usual 19 to 21 MPG statistics of Mahindra TR40 Pick-Up truck. But all said and done, it is still to be seen if Mahindra & Mahindra would ever launch a Ssangyong vehicle in America or even a Pick-Up truck which would be based on the XUV500 platform. in the American SUV and light pick-up truck market. But the firm is still taking the risk to re-enter America. Mahindra & Mahindra is secretive about its future plans in this foreign country, but a new rumor is doing the rounds, according to which, Mahindra may use a vehicle from its South Korean acquisition, Ssangyong to launch the Korando Sports Pick-Up truck in the US, which was showcased in the 2011 Geneva Motor Show as a concept SUT.